In the not too distant past, Republicans looked at counties like Frederick and got excited. Fast growing exurbs like this and the loss of population in places like Baltimore City would gradually shift Maryland in their direction. Frederick has indeed grown but disappointed the GOP bitterly by becoming much more Democratic in the process. President Obama received 49% in 2008 and 47% in 2012 of Frederick votes. A marked increase compared to the 39% received by Al Gore in 2000. Under the old legislative district plan, Frederick had all but a tiny piece of District 3. 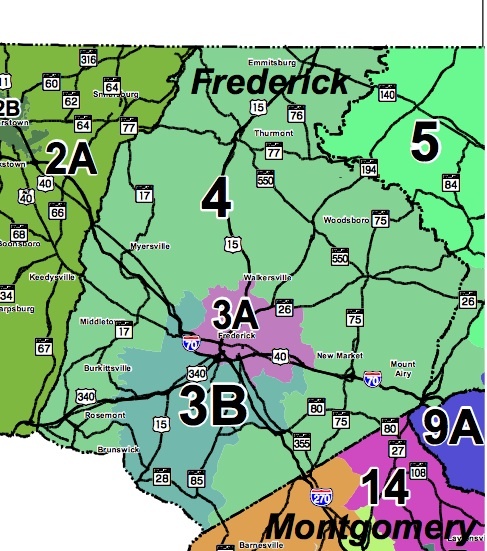 Frederick and Carroll Counties shared District 4 with 4A located in Frederick electing two delegates. District 4B, situated entirely in Carroll except a small bit around Mt. Airy, elected the remaining delegate. Redistricting has been good to Frederick. As shown below, Frederick nearly has all of two full districts under the new plan–less than 10% of District 4 remains in Carroll and its subdistricts have accordingly been eliminated. The new districts follow Frederick’s partisan divisions more closely than the old map. 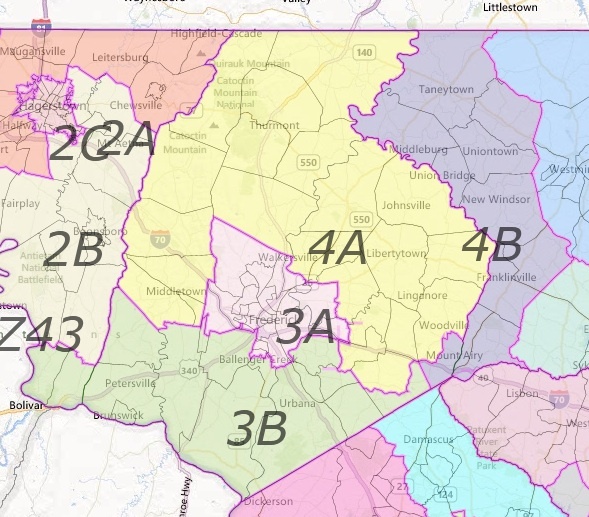 As the map below from Dave’s Redistricting shows, District 3 takes in the most Democratic portions–the City of Frederick and areas to the south–with the remaining much more Republican areas in the County composing District 4. Additionally, Del. Michael Hough’s (R-3B) home was moved to District 4. Altogether, the changes help Democrats as it strengthens their position in swingy District 3. Meanwhile, District 4 remains a little piece of Republican heaven. In District 3, former Frederick Mayor Ron Young toppled shrill right-wing gadlfly Sen. Alex Mooney in 2010. He moved on to running the State GOP into the ground before fleeing to West Virginia for redder pastures where he is now a congressional candidate. Even Maryland Republicans don’t seem to miss him. Sen. Ron Young has taken liberal stands–he was a strong supporter of marriage equality while Mooney was one of its most vocal opponents–but no one can touch him. He is unopposed in the primary and general election. All three delegate seats are open. In 3A, neither Del. Patrick Hogan (R) nor Del. Galen Clagett (D) will seek reelection with Hogan’s decision at least partly influenced by the more Democratic version of this Frederick City district. The new redistricting plan placed Del. Michael Hough’s (R-3A) home in District 4. In District 31A, Sen Ron Young’s wife, Karen Lewis Young has filed for one of the two delegate seats but has not filed a campaign finance report (or at least one doesn’t come up when I search for it). She has a website for her unsuccessful run for the Frederick mayoralty as the Democratic nominee in 2013. In that contest, Young came in second with 32% behind Republican Randy McClement who won with 49%. If elected, Sen. Young and Del. Young would be the only husband and wife team in the General Assembly. The other potentially strong candidate appears to be Frederick Alderman Carol Krimm. Though she has just $1700 in her campaign account, she has held office and aldermen run citywide, so she is already known throughout a fair portion of the district. Young and Krimm seems well positioned to win the two seats, if only due to the weakness of the other competition that has filed so far. Candidate Nicholas Bouquet just moved to Frederick one year ago and has also filed no campaign finance report (or again, it just doesn’t appear when I search for it). Roger Wilson has raised no money. The two Republican candidates are poorly funded. In 3B, Frederick County Democratic Central Committee Vice Chair Stephen Slater is the only filed candidate. Of course, the filing deadline has not yet arrived. All four seats in District 4 are safe for the Republicans. Though Del. Michael Hough’s website still solicits support for running in 3B, his home is now in District 4 and plans to run for the Senate against incumbent Sen. Minority Leader David Brinkley. Hough’s very active twitter feed of anti-Obamacare, anti-tax. anti-union, global warming denying posts sure has the look of a Republican straining to endear himself to tea-party voters. Brinkley has a reputation in the Senate of a smart and cordial staunch–but not certifiable–conservative. Which means, of course, that he could be in trouble with the wing of his party that demands total purity and legislative ineffectiveness to gain election. Brinkley has just $21K in his campaign account and has not yet filed for reelection. Along with Del. Kathy Afzali (R-4A), Brinkley sought unsuccessfully to defeat Rep. Roscoe Bartlett in the Republican primary. Bartlett limped home with 44% to 20% for Brinkley and 10% for Afzali. Some may speculate that Brinkley may be getting tired of the General Assembly, though he gives every sign of planning to run for reelection. Michael Hough has a more robust $115K in his campaign account and will make it a humdinger of a primary. Neither Brinkley nor Hough can raise funds during the session, leaving little time before the primary and giving Hough an edge. On the other hand, Hough will need to get known in a lot of new territory that Brinkley has represented in the House or Senate since the 1994 election. Hough will try to beat Brinkley by running to his right and presenting himself as a more authentic conservative. Only one Democrat has bothered to file for delegate in District 4 while the Republicans have three filed candidates so far: Del. Kathy Afzali ($66K on hand) and Del. Kelly Schulz ($45K) along with Mt. Airy Councilwoman Wendi Peters ($13K). David Vogt and Ken Timmerman also plan to run but has yet to file. Gaffe-prone Vogt ran for Congress but dropped out before the primary. Timmerman is moving to the district to run for the seat.